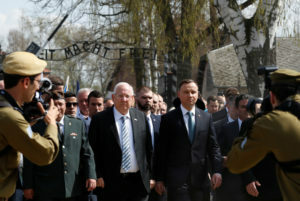 WARSAW, Poland — The presidents of Israel and Poland joined thousands of others Thursday for a Holocaust remembrance event at the former Nazi death camps of Auschwitz and Birkenau, hoping to put recent tensions behind them. They then led thousands, including many young Jews from around the world, in the March of the Living, which takes place each year on Israel’s Holocaust Remembrance Day. “Our common presence here shows the world: Never again anti-Semitism, never again genocide, never again Holocaust,” Duda said during a joint news conference. Rivlin recalled how Poland was the cradle of Jewish culture before the Holocaust. But he also referred to the “deep disagreement” his country has had with Poland over its passage earlier this year of a Holocaust speech law. The law criminalizes blaming Poland for crimes committed by Nazi German forces during their wartime occupation. The Polish government says its aim is to prevent Poland from unfairly being blamed for Germany’s crimes. Israel fears the law’s true intent is to whitewash Polish sins by repressing discussion about those Poles who helped the Germans kill Jews. Duda, whose wife has a Jewish father, insisted the disputed law never aimed to “block testimony” about the Holocaust.